If it hasn't come across in any of my previous posts, creating a food blog has been one of the best decisions I've made to date. Not only does this blog give me a chance to keep writing in my days beyond graduate school (is it wrong that I actually miss writing research papers? ), but it also gives me the opportunity to attend fun events throughout New York and the opportunity to try new products. So, as promised, it's time to announce another amazing Taste As You Go giveaway! I mentioned earlier that the folks at Barefoot Wine were generous. How generous? 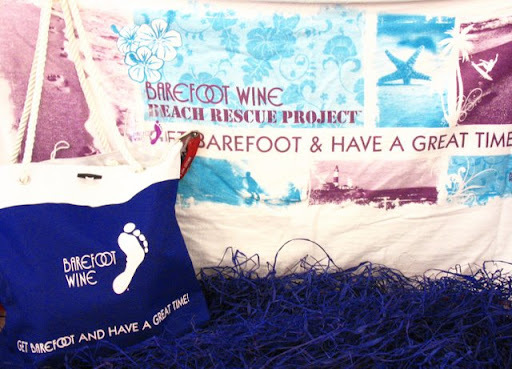 Generous enough to provide the prize for this giveaway (a tote bag, wine opener, stemless wine glass, and a big soft beach towel) if I would agree to spread the word about their new online Barefoot Republic Community and Facebook page!! Having this blog makes it incredibly easy for me to do that. Do mental images of a beach vacation invade your thoughts throughout the day? Does the idea of winning a tote bag full of summer essentials appeal to you? If so, then you should enter the Barefoot Wine & Bubbly Summer Beach Giveaway for your chance to get your hands on some really great stuff! This giveaway is open to US readers only and will end on Friday, July 3, 2009 at 11:59pm EST. ONE winner will be chosen with the help of Random.org on Saturday, July 4, 2009 in honor of Independence Day and will be announced here.